Representatives of the military and political leadership in Nagorno-Karabakh argue that militants that once was trained by or fought along with ISIS and other terrorist groups in Syria and Iraq were involved in atrocities against the Armenian military and civilians during the four-day war with Azerbaijan in early April. While no conclusive evidence of the claims has been presented yet, Armenian experts do not find it odd for Azerbaijan, considering history and current tendencies. They say, however, that everything should be done to hold Baku accountable for the war crimes. 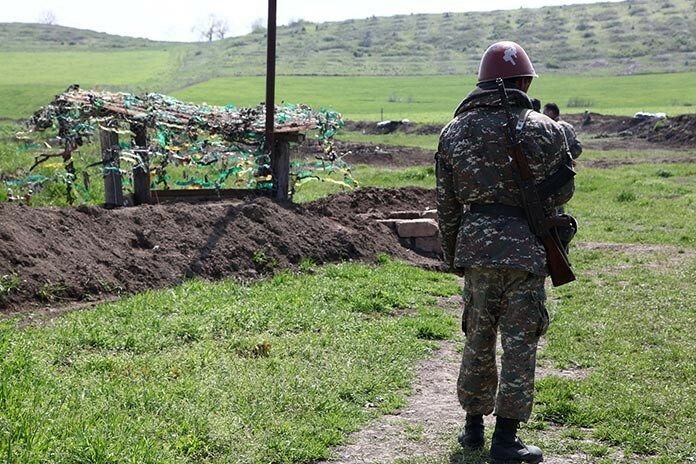 As Azerbaijan renewed hostilities in Nagorno-Karabakh on April 2, its commando units carried out a raid inside the border village of Talish in the north of Nagorno-Karabakh. Evidence that transpired later suggests that they tortured elderly members of a local family whom their children did not manage to evacuate in time. All three, including a 92-year-old woman, were brutally killed and the dead bodies of at least two of the elderly people were mutilated. This and other crimes committed against Armenians, including the beheading of an ethnic Yezidi serviceman of Nagorno-Karabakh’s Defense Army, has sparked an outrage in the Armenian society against the background of reports that Azerbaijan has been using mercenaries, including possible ISIS-trained militants, in its operations. “Azerbaijan has brought out to the frontlines mercenaries who are wanted by different countries. All this shows that Azerbaijan flagrantly violates all international humanitarian norms and conventions, in particular the Geneva Convention, using weapons that have destructive features in targeting civilian facilities, involving mercenaries and international terrorists in its armed forces,” David Babayan, a spokesman for the Nagorno-Karabakh president, said. Such statements have also been made by other officials, including Armenian Defense Minister Seyran Ohanyan. “Azerbaijan has conducted large-scale military operations with the use of new weapons, as well as terrorists and mercenaries,” Ohanyan told Armenian lawmakers last week. Arguments of the Armenian side are also based on what has been observed by its servicemen during close engagements with the adversary as well as indirect evidence, including the decapitation of an Armenian soldier. Ethnic Yezidi soldier Kyaram Sloyan was killed in an engagement with advancing Azeri forces, and later his head was severed and reportedly paraded in Azerbaijani villages as a trophy. It became possible for the Armenian side to later recover the head and give it to the parents of Sloyan, who reburied it together with the soldier’s body. Azerbaijan also used mercenaries during the first Karabakh war in 1992-1994. About 1,500 Afghan Mujahideen are believed to have been involved in the Azeri military during those years and international observers also repeatedly testified to their presence in the Karabakh conflict zone back then. Azerbaijan’s use of mercenaries then was also proved by documents, military maps, letters and photographs, dictionaries, foreign banknotes and other pieces of evidence found in the battlefields. Armenian analysts and experts believe this time the issue should be raised seriously. “The use of mercenaries is viewed as problematic from the point of view of international law and Azerbaijan should be punished for that. This also shows that Azerbaijan has a problem with its soldiers. We have seen that they are armed with the most state-of-the-art weapons, but they are bad soldiers,” analyst Levon Shirinyan told ArmeniaNow, adding that both in the 1990s and now the presence of terrorist groups on the Azerbaijani side did not help Azerbaijan gain any military advantage over Armenians. Political analyst Aghasi Yenokyan thinks that if allegations that Gray Wolves and ISIS militants fought for Azerbaijan are proved, it will trigger a great international response and will change the configuration and meaning of the conflict as terrorism has become a global threat today.